Back from tour and back on the water. After spending 13 days in my non-agile 16 foot big touring piece of plastic, I love spinning around with my 12 foot fishing boat. Lee, Mike p and hit Lynnhaven on Fri. Back in the back of the west side Mike was around a corner from Lee and I. He called on the radio, "I just landed a cobia." Lee said ,"What!" and I replied,"No way!" and we both paddled over to him. Sure 'nuf he had a little baby 17" long. Probably a six month old fish. I tagged and Mike released it. We eventually made our way to the bridge for the last of the outgoing current. I caught a few small flounder but the hot rod of the day was Mike with a 23"er and a 21" flounder. Mike had his hands full with the 21'er. First it jumped out from under his legs. Then it nearly broke off running around a pilling. When Mike finally landed it again, it kicked his paddle off the deck. Lee had a keeper next to him, when he got his foot under it to do the scoop, the flounder got unhooked and a soon as it felt lee's leg, it jumped 3 feet into the air and dove in without a sound. Sat I went to the HRBT in search of big croaker. I was out at Fort Wool when the wind from the storm that was hidden behind the smoke hit me. I spent about an hour behind Fort Wool hiding from the 35mph wind. The wind dropped to 20 and I crept back. Lee, Mike and I managed to beat the wind and fish for flounder at the HRBT. The flounder were on as usual for May. We caught 20 to 30, 11 to 16 "ers. Lee landed one 21"er lost another that size on the scoop. Lee said " I thought I had him in!" The flounder escaped from under his leg. I have been preparing for the Virginia Chesapeake Bay Tour. I will be launching from chicks beach at the southern foot of the CBBT, crossing the mouth of the bay. The first week I will paddle north along the eastern shore of the bay. Crossing again at the VA/MD border to Smith point at the mouth of the Potomac. Then i will take a week to work my way down the western side of the bay. All in all its 200 miles and should take me two weeks. From the way the winds have been sense November, this might be a tough tour. All open water and nowhere to hide from the wind. This flounder must have got stuck in a mono loop when it was smaller. He was heathy and strong. He had grown around the line. A day on the Reds that I had dreamt about. THURS we paddle to the shoals in time for the turn of the tide. We didn't have a run for hours. Just as we were ready to head in, a wave of reds came through. Small, 40" to 44", but Lee and I landed reds. FRI will likely be referred to 'That Friday'. The day started with a few of us committed to the black drum, buying a bushel of shucked clams at Chris's, and paddling out with a growing north-west wind. We fished the peak time with allot of rays and no black drum. We didn't even see any landed by the boaters around us. Next on the target was the reds. Big Max went for a long distance flounder drift, all the way around Fishermans island. we just happend to be in the right place at the right time. When all the conditions came together and the day all drum hunters dream of unfolds, the red run that only legends and tall tails are made of, Happened!! 11 reds were landed and 2 by Big Max when he arrived. The action was steady, although smaller 'cookie cutter' size at 39" to 44" with only one at citation size. One shot at big fish and a day in Rudee. Lee, Mike p, Damien and I paddled out to fish the slack current for the black drum. The current ran an hour later and the giant rolling swells made it hard to stay straight anchored from the stern. We only saw one fish caught about 75 yards away. The only full day I could put in this week was blowy. So Lee and I hit Rudee, Mike met up with us later. We paddled directly to the flounder spot looking to fill out a tagging sheet. Lee's first one was 19", it didn't get a tag. But the fifteen 11 to 16"ers did. We must have stuck them all, the bite cut off, and we moved. We approached a good spot and Lee said, "We're going to roll up on this spot and get into a school of big pups." Lee cast a split second before me and splashes down in the place I was aiming for. My jig nearly lands on top of his. On Lee's second twitch it gets grabbed and line starts pulling out. I yelled " You called it!" Lee played around to much with the estimated 30" red and it wore through his leader. I paddled back in and made a cast. I hooked into a 25" red, then Lee with a 24"er and me with 24"er. Mike showed up but the red bite was over so we went back to the flounder and Mike p caught a striper. The wind died out and was I itching to get back on the shoals. I was able to leave work and have baits in the water in two hours. Ric was meeting me out there, but in his 20' Jones Brothers, with Zach and his brother Roger. Ric sets up on the tip of the shoal and I anchored up 50 yards back. As soon as the current starts running Zach's and Ric's rods go and they land two, 47 and 48"ers. A few min later they get another. The current and the wind really began to crank and Mike and I headed back, with a plan for Monday. MON. Cutting it close to missing the tide, I make it in time to get set up in the same spot on the tip of the shoal. About an hour into the Incoming current I was thinking," Here I am again, not catching anything." And my rod goes off! I had to stay on anchor for the entire fight. With the angle the fish had me, I would have been pulled into the white water. I had the 44"er next to the boat when my back rod comes alive! Double! Lee and I have had doubles before, landing multiple striper doubles. We both have had double reds and handed them off to each other because the second hit to soon into the initial fight. This one was right on time, I was seconds from landing the first one. I yank the 44"er in, and grab the back rod. I pulled, and the fish was not going to budge. This fish was off the shoal, so I dropped anchor and got over top of 'em. It was a mean, close fight. At one point I thought the big mad red was going to thrash his way into my boat but covered me in water with one sweep of his tail against my boat. I finally had the leader, after at least three attempts, and scooped the 48"er over the first one, and into my lap. With two big reds on board, I dropped my secondary anchor to stop my fast drift, and mike got some shots. We stayed for another hour before the current and the wind, again, pushed us off. TUES, Lee and I hit it again but it was too nice and pretty of a day for the reds to be active. It was so calm we walked around on the shoals. We did see one boated in the slew, and one small black drum. FRI was windy, Lee and I hit Rudee, my goal was to finish out my tagging sheet, and we did it with allot of flounder. One flounder was 19" and Lee landed a 24"red. I even caught my first little red of the year. Lee also picked up a speck on the way back giving him a slam. On the way back from Rudee, thought about the news paper report about the black drum off of kiptopeke, it reported the fish were being caught around the slacking tides. I wondered if that meant day time. The main reason we haven't targeted them was we always heard that it was a evening bite, and I wasn't going to fish at night in the open waters on the other side of latimer shoals. I called Chris, owner of Chris's bait and tackle and asked her,"Are they biting during the day?" she said, " Yea!" that's all I needed to hear. Big fish within our range, we are there! The wind was forecasted for East at 10 when I went to bed. SAT morning the forecast had changed to North West at 10 to 15 and there was rain on the radar, on its way. I was mad the wind forecast had changed while I was asleep, but we all went anyway, figuring we would have that window before the blow, and met at Chris's at 6am to buy clams. Chris has the perfect deal for kayak drum anglers, a bushel of shucked clams. It was like $50 split between three of us (Lee, Zach, and me) way better that paddling out a hundred pounds of shells. We paddle out in the rain and Lee was hating me, he's not to fond of rain. He looked at me with the 'what have you gotten me into' look on his face. 40 min later we set up on the other side of Latimer shoals and soak some clams. The rain quit and there was hardly any wind. We did see a water spout about 20 mile north over the bay, otherwise a beautiful overcast morning. 19" keeper Flounder out of Rudee. Tagged and released. Out past the ships, into the rain. Seconds later, Lee hears a 'click, click'.
" That's not a ray!" It was a windy week and a winder weekend. The only water we could fish was Rudee inlet. The action was fair and some fish where caught, and some tags where stuck. WED Ric and I hit Rudee, I hooked a few flounder and Ric had a nice little red. THURS Lee, Mike and I paddle into the wind at Rudee. I had a tip that the specks were hitting suspended twitch baits. I carry a yo-zuri crystal minnow for casting onto the rocks for striper, I hardly ever use it and tied it on. I meet Lee and Mike and on one of my first couple cast I hook up with a 20" speck. We paddled around and caught a few flounder including the one I caught on the yo-zuri. Flounder on a floating crank bait. Not uncommon anymore, I always hear stories of striper fishermen trolling, and landing big flounder on mo-jo's and stretches. SAT Lee and I had to fish somewhere so back to Rudee we went, and back into the 15 to 20mph south wind. We work around until Lee found a small red then we anchored up. Lee had a good run and pulled the hook, he was mad but he had another chance. He landed a hard fighting 26" red. I caught a few flounder and my first roundhead of the year. With the low tide at 5, we were a little late, finally dropping lines at 6 with the current already flooding back in. I was anchored a little to close to lee, about 30 yards behind him. His back line started screaming! He tightened down and the giant red surfaced 10 yards out beside me." BIG, BIG RED! That's your citation there Lee!" I yelled as I reeled my line up and dropped off of my anchor to watch the fight. I backed out of the way and Lee said " Something wrong, hes on your rope!" I paddled to my buoy. The line had slid up the rope and got stuck on the buoy. Luckily it wasn't wrapped and I was able to grab the line and just let it off of the buoy. I backed out to watch the rest of the battle with Shante. This is when we saw the most incredible display of balance and kayak angling skill. The sea beast pulled Lee parallel to the waves and current, and his bow was still anchored. 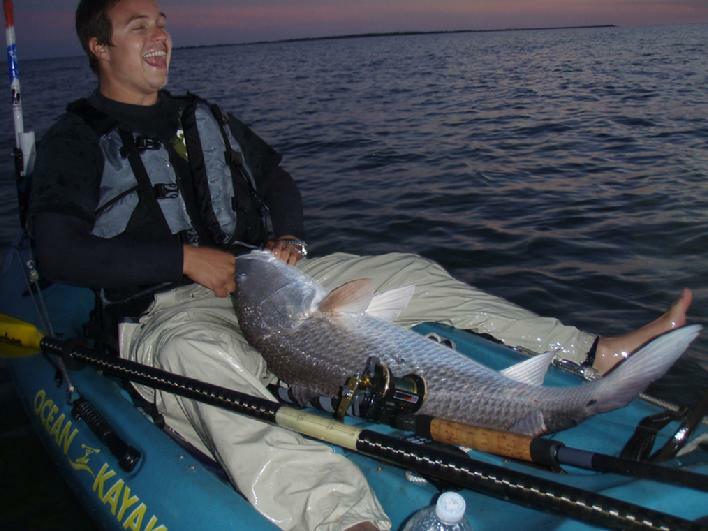 A four foot roller peaked and broke, heading for Lee, who was helpless to adjust the kayak. The wall of white water slammed lee broadside on the top of the big swell. We held our breath watching Lee teeter on a razors edge! The foamy water exploded over his bow as it jerked hard down the back side of the wave and he stayed with it, all while the big red lunged the other way. We cheered!! When the rollers break, paddle right into it and get ready for the soaking! the swells were down and the current was weak. Lee, Ric, Zach and I fished into the late afternoon with nothing but dog sharks to fight. Right after sunset, Lee said over the radio," I just heard drum underneath me." Then he had something on. He thought it was a large shark by the weak fight but then at the boat it got mad! Fighting Lee off anchor for about 150 yards down current before he landed the 47". Right as Lee landed his Ric's had one on. 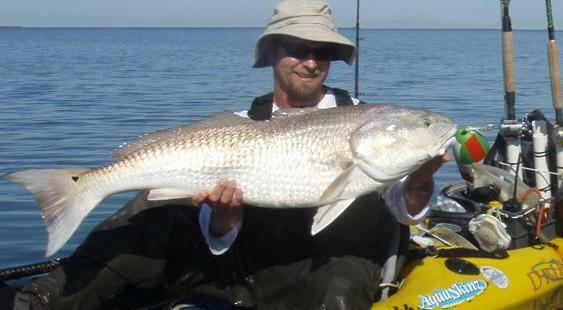 Each red drum fight at the shoals is a memorable one, because each fight is its own chaotic experience. Ric's fish must have ran in circles around his anchor rope. It was stuck and Lee had to help pull Ric's anchor. He worked through it and landed a big 47"er. Paddling back in the pitch black night we began to hear something, we stopped and drum were drumming all around us. I quickly got a crab down and drifted along with the current, but none were interested. That we a cool but eerie sound. SAT morning there was hardly any heavy breakers on the shoal. An occasional 3 footer would lazily roll in, but very few. I could easily paddle right into the shoal and toss my bait into the 3 foot water and get out without getting wet. The wind picked up to 15mph from the south-west and Lee and I paddled back. Months ago I was looking at the full moon and tide predictions for April and decided to go for the big reds two weeks early. Last week a report from Chris's bait and tackle solidified my test monkey mission. The report was two reds at 46" and 48". I checked last years fishing log and the water temp for this week was the same as when I caught my first red last year. I didn't have to talk Lee into it, " Lets go!" The predicted low tide time was 2ish. We drifted with the final hour of the outgoing tide. On the approach, I took a left when I should have cut right to get to the same slew from last year. The edge of the shoal that we were on looked just fine. The current was still slowly going out. I paddled in, between the breakers and lobbed a crab onto the top of the shoal, and back-paddled out. 10 minutes later I began reeling the bait in to re-cast, it suddenly got heavy. I froze.... a huge head swung on the other end of my line. "No ray here, this is a red!" I reeled more tension on the line and the fish ran deeper into the whitewater, pealing line off. Then I noticed the waves were helping the fish pull me into the wash. I had no choice, I loosened my drag, put my rod in the holder and tried to paddle out into the slew. I paddled a few yards as the red went the other way. I looked down and my spool was nearly down to the backing. I turned, tighten down and got some line back, but then I was back on the edge of the shoal. This time I tried to tow him out. With the drag tight, i paddled hard, not going anywhere! This fish had me at a stand still. Luckily the circle hook stayed stuck, even though the line went slack a couple times. When I was just out off reach of the breakers. I was able to get my anchor set up, over the side and secured from the stern. I held on to the beast as he slowly rolled of the shoal. Lee came paddling up to me " What man, you got a ray?" "No way! this has gotta be a red, and a big one!" It finally surfaced about 10 yards out, BIG RED! Lee paddled up and pulled my anchor up, and tossed it in my boat, freeing me up to land the red. It took another 10 minutes to finally get a hold of 'em. He landed in with a heavy lean. A healthy big red 48" at least 40lbs. The waves grew progressively with the rising tide, not huge but up to four feet. Dog sharks were tearing up our small bait supply. We were out by 5:30. Test monkey success, two weeks early. We didn't even have to paddle back, just rode in the fast full moon tide. The next day Lee and I went to the HRBT, even though we didn't really have to paddle to and from the shoals, hours of dealing with ocean rollers including the half dozen the rolled over Lee and I, wore us out. We wanted to do some easy going fishing. I finally caught something other than a striper at the HRBT, a 15" flounder, my first of the year. Over all I caught five 15" to 16"ers. Lee hit Rudee earlier in the week and caught the Rudee slam, blue, red, speck, and flounder. Its on, spring has finally sprung. GET ON"EM. kev.